i try to send out little sample skeins with all of my yarn orders. i don't often know what becomes of these mini skeins, and so i was really, really excited to hear from stacey last night. she has been saving up sample skeins that i have sent to her, and she made her daughter this incredible hat! i love, love, love it! thanks so much for sharing your beautiful knitting, stacey! you really made my day! i am in love with this scarf, knit by kristen with my yarn. isn't it pretty? i know i have shared before how enormously gratifying it is for me to get to peek at the things my yarn becomes after i send it out into the world, and this was about as close to instant gratification as it gets. kristen works fast! the yarn is a bulky bamboo single, and i believe that kristen used some big needles to make her gorgeous, drapey garter stitch creation. in other news, there is no news here, at least on the baby front. after 2+ weeks of feeling like labor might be starting pretty much every night, i'm trying hard to just let go and not obsess over it, at least not so much. feeling this way for this length of time (which seems like forever in baby-waiting time) can get a little discouraging after awhile. i'm feeling too uptight and too grouchy to be very zen about it at this point. i don't want to sound whiny, so i will stop here, knowing that she will come when she is good and done cooking. having said that, any happy birth thoughts anyone can spare and swing in my direction would be much appreciated! *just in case it needs to be clarified, the pretty is kristen's scarf, the not so pretty is me grumbling! so cute. i get such a good feeling seeing things that people have knit with my yarn. i hope you are having a great weekend. i'm feeling swamped by all the not-so-fun stuff that needs to get done, and all i want to do is play outside. *leah sold some really cool knit goods at renegade this year. those two days were such a busy blur and i wish i had been able to spend some time really looking at her work. check out leah's etsy store here! want to see some cool stuff? i have been meaning to post these here. seeing these pictures thrilled me, lots. first there is yarn spun by the very able hands of ms. super talented naomi. i don't think that i have ever seen a yarn spun by this lady that didn't take my breath away. and! 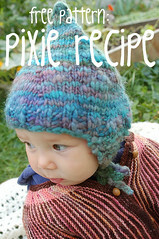 there is one heck of a cute hat knit up linda of lindamade fame! yay! i was so excited to see this! and happy weekend to all! i have a busy one ahead and i'm steeling myself for it with beer + simpsons + spinning right now. that should do the trick. Today marks the first birthday of LuluBeans.com! It's hard to believe a whole year has gone by. I wish I was doing something celebratory, but I have spent most of the day snuggling up with a sick little cuddly girl and feeling a little funk-ay myself (and not in a good way). I did want to share the above images though, sent to me last night by a wonderful customer and fabulous knitter. Thanks again for sharing your pictures, Stacey! The hat was knit with my Waterlilies yarn, and the Edgar was knit using my Orchids yarn!! These pictures are the best "birthday" present a girl could ask for. Seeing what people create with my yarn is such an fabulous feeling. I think that part of what thrills me is the vicarious pleasure of seeing what knitters are able to make with my yarn- after all, I am constantly surrounded by a heaps of this gorgeous yarn, and rarely do I get a chance to make anything out of it with my own two hands and a set of sticks. But there is more to it than that, and I will stop short of making the analogy of raising your babies and then watching them go out into the world and become their own people, even though it would in fact we a really apt comparison, if children were brightly colored inanimate piles of carefully twisted sheep hair. I'll just say that there is something very emotional and incredibly gratifying about making something, and having your involvement with that something stop at a very specific point, and then sending that something out there, and then seeing that another person's creativity and imagination have given that something a whole new life. It's good stuff. I am feeling a huge amount of gratitude today, and I want to extend my thanks to each and person who has bought yarn or another fibery creation from me over the past year. Your support has meant so much to me! And images like the ones above, well, they are just the luscious icing on this sweet cake.